The RMC provides the Environmental, Health and Safety Professional the opportunity to share information and learn about current EHS issues and to interact with other professionals with common interests. See all of the RMC's Activities planned for this year and what we've done in past years. The RMC offers many great Tours, Seminars, and Speakers on Safety, Health, and Environmental topics. Come join us for these thought provoking and entertaining networking opportunities. Read our March 2016 Newsletter. RMC-AHMP is an affiliated chapter of the AHMP. See our Chapter Brochure for more information. The Alliance of Hazardous Materials Professionals™ (AHMP), is a professional association with a membership consisting of the nation’s leading experts in environmental, health, safety and security management. AHMP is the only national organization devoted to the professional advancement of the hazardous materials management field. AHMP Vision: "To be the recognized global leader and resource for hazardous materials professionals." 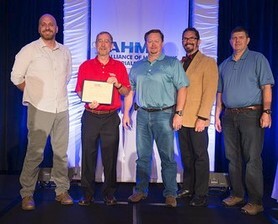 AHMP Mission: "To provide opportunities to gain knowledge about hazardous materials management, create gathering places (communities) and a voice for professionals with common interests in hazard materials management and provide management support for smaller communities of hazardous materials professionals." Please visit the AHMP website for additional information on AHMP.